At the end of June (which you’ll recall as a brutally hot and humid week), your humble narrator found himself in the wilds of Brooklyn, and observed that some New York traditions haven’t gone out of style. Opining about the seemingly forgotten Bearclaw danish (the absence of which from New York City menus seems to indicate a glitch in the Matrix), the loss of the impact prefix “‘effin” at the beginning of every statement, and the Krishna lunch at Tompkins Square are a few of my regular rants- but until this hot day- I didn’t realize that kids just don’t play in the fire hydrant stream very much these days- a common sight during the first half of my life. 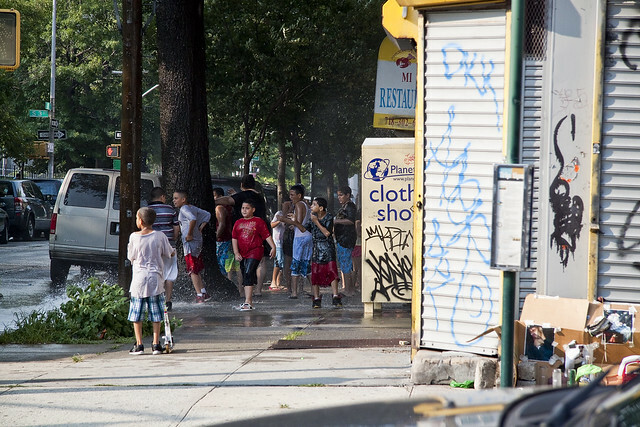 During the 70’s- if a city kid wanted to swim, you went to the beach or a rich relative’s house on Long Island. 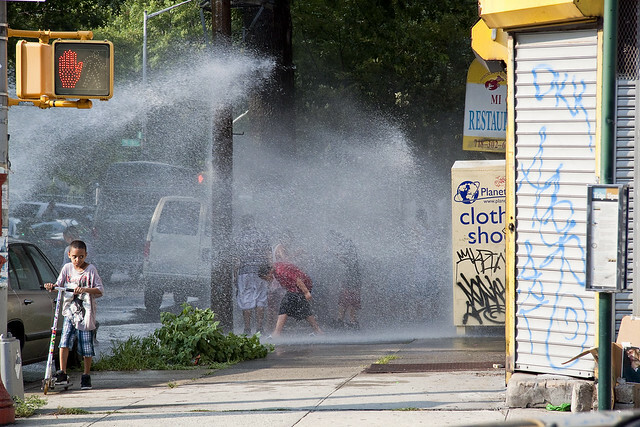 When you wanted to cool off, you opened a hydrant. 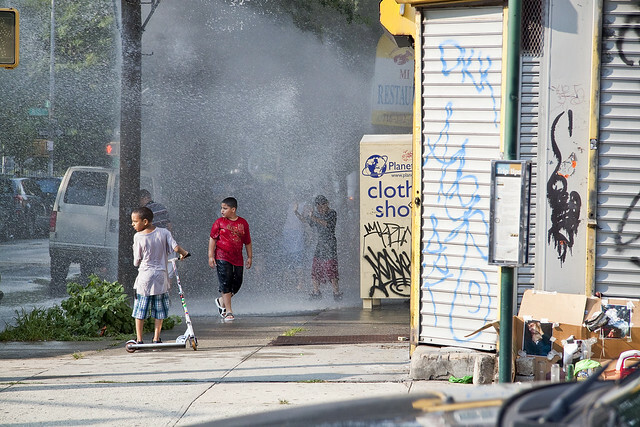 The cops and FDNY would always show up and close it with some special wrench, but eventually, sprinkler caps came in and were encouraged for use by the municipality in order to avoid a precipitous system wide drop in pressure across the neighborhood during heat waves- a deadly event in case of a house or building fire. Trusted members of the community would be entrusted with these caps, and the special wrench. Don’t forget, this is before air conditioning became ubiquitous. 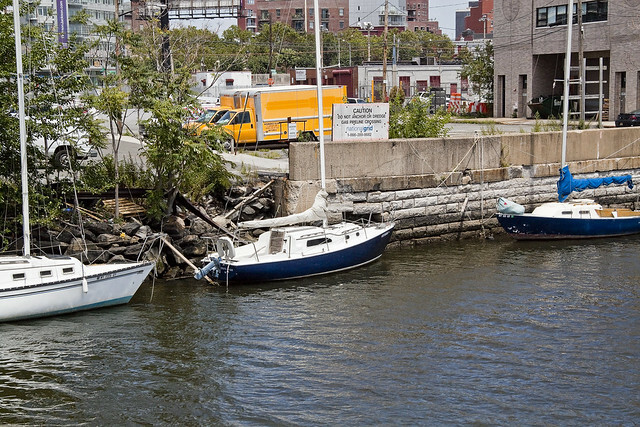 On my block, I believe it was a Sheepshead Bay fishing ship’s captain- Joe Manarino (the dad, not Joseph the son or Joey the grandson)– who had the special wrench and sprinkler cap in his garage. 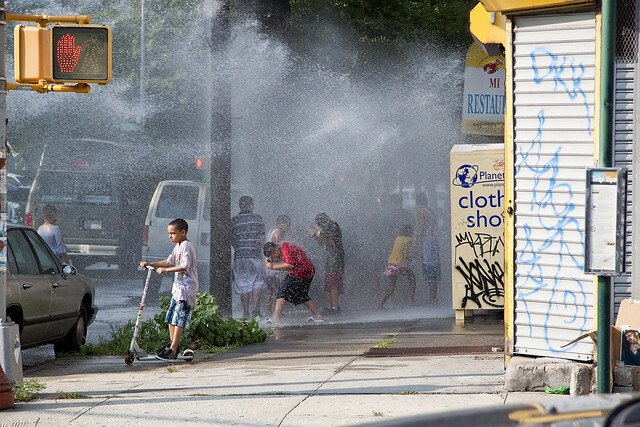 In Brooklyn’s less… ahem… savory… neighborhoods, the hydrants would just be thrown open with pure urban muscle to shoot high pressure water all over the kids. My dad always referred to this as “an ‘effin free car wash” and make it a point of driving around on hot days to score a free high pressure wash for the family Plymouth. 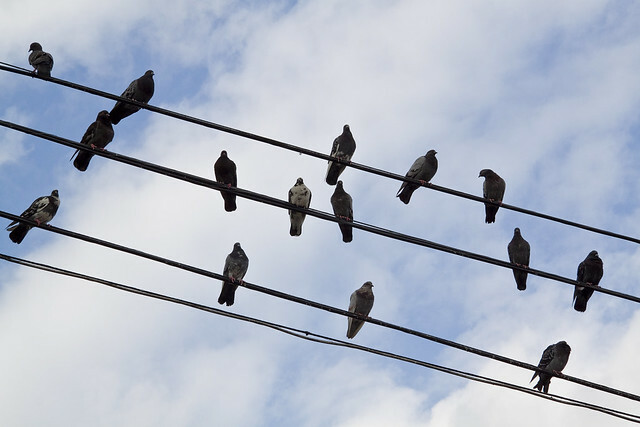 He’d make a U-turn and get both sides done, much to the chagrin of the local nestlings forced to wait for the encrusted bird poop to loosen from the side windows. The technique involved in shaping the flow of water shooting out of the hydrant nozzle involved using a tomato or coffee can with both the top and bottom cut off, which was placed flush against the nozzle. By torquing and angling the can, obtuse angles were formed, as well as shallow arcs and blasting straight shots. If you’re too close to the source, it feels like you’re being pelted with gravel, and great joy was to be had by we lads when one of the female members of our cohort would find part of her bathing suit coterie carried away by the water. The tough guys always tried to walk right into it, but were inevitably unable to deny the “hard deck” of physics when the flow struck, below the belt. Wonder if any of the local bakeries have Bearclaws for sale around here, or Grape Nehi, or those weird wax tubes with the sugar water in them? This is the corner of South 4th and Rodney, just in case you’re curious. This soldier of the realm is found along the hoary streets of Greenpoint in Brooklyn, specifically the corner of Leonard and Bayard streets. Having suffered the attentions of local vandals and inopportune traffic collisions for much of its long reign, this watchtower of the FDNY is stalwart in its mission. One wonders if it took up its position in the ancient time when Bayard was known as Sandford Street, and Leonard as Third Street? ps- postings will be a bit sporadic over the next few days, your humble narrator is a bit burned out again, and requires a little break. There still will be posts coming your way through the Labor Day holiday, but they’ll be shorties- a few more “Project Firebox” and a couple of things I’ve noticed that aren’t earth shattering but interesting nevertheless. A full schedule of damned revelations and hellish probings will resume after said holiday. I’ll be roaming around the neighborhood, however, so if there’s anything crazy going on- you can always contact me here or just leave a comment. All comments are held back from immediate posting for review of course, so if its something you don’t want to disseminate to everyone, mention it at the top of the missive. Look forward to updates on the St. Michael’s ritual site, which I haven’t mentioned for a while, but which has been monitored after each full moon. 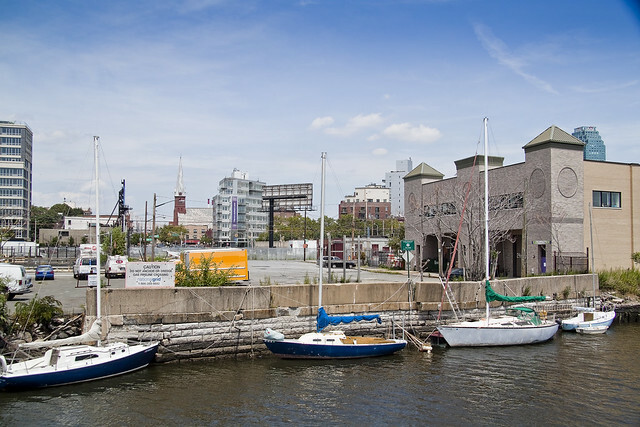 There’s also a trip through Greenpoint in the works, and a chance for you- lords and ladies- to get tickets for a boat ride up the Creek in October . More to come, promise. On one of the periodic Working Harbor Committee trips across the estuarine expanses of New York Harbor, your humble narrator became paralyzed with terror when a benthic shadow slid alongside the vessel which carried my withered husk. The shape, as that’s all I saw of it, made no sense to me and matched no phyla or phenotype familiar to my admittedly limited experience. Imagination working, it was decided that the best course of action to steady my faltering sanity would be to focus in on those things material, tangible, and engineered according to the familiar laws of physics. 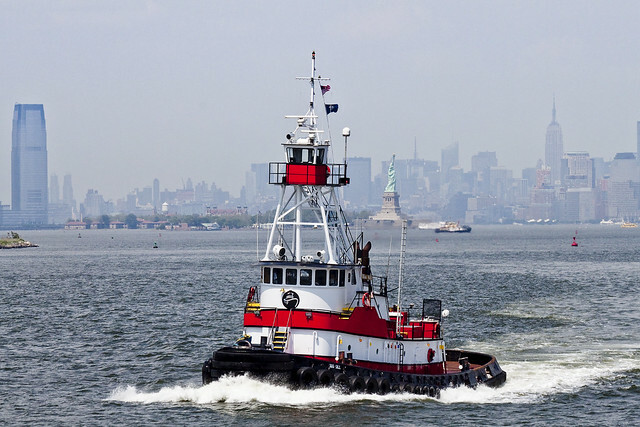 In this case, it was the Tugboat “Miss Gill” cruising in photogenic splendor against the mist wrapped backdrop of the shining city of Manhattan. The Miss Gill spent a year at Main Iron Works in 2005 having various tanks, exterior plate and bulwarks renewed. During this yard period her winch was completely rebuilt and two new 2′ cables were installed. We bought her during this shipyard renovation, operated the her for 24 months and in mid 2008 took her back to the yard for further investment. We replaced her main engines with Caterpillar tier II technology that make her an honest 3000BHP, her reduction gears were replaced with ZF technology, and new John Deere/Kohler generators were installed. These tier II engines are the most advanced electronic platform available. The shadow, or shape, that I had spied was long obscured when a Coast Guard vessel suddenly burst into view. Fully armed, one of the redoubtable guardians of the archipelago’s frontier was manning a high caliber weapon and the boat was moving at a fantastic rate of speed, punching its way through the heavy wakes of ferry, tug, and ship alike. 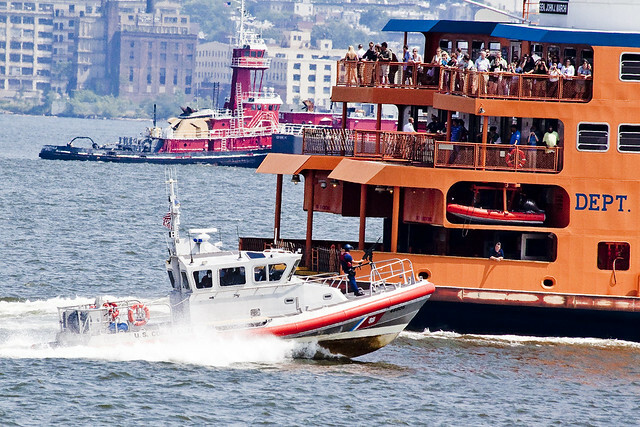 Recognizing that it shared some design characteristics with an NYPD harbor craft described in a recent post here- at your Newtown Pentacle- “exhalted beyond thought“, I noticed it was being followed by an even larger Federal boat. I believe this to be a Defender class “Response Boat Small”. 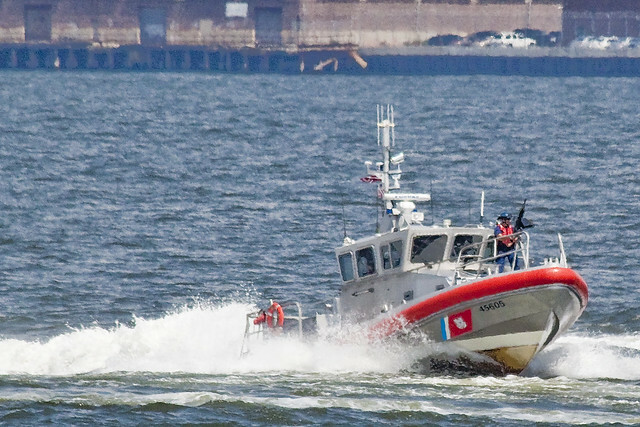 Developed in a direct response to the need for additional Homeland Security assets in the wake of the September 11th terrorist attacks, the Defender Class boats were procured under an emergency acquisition authority. With a contract for up to 700 standard response boats, the Defender Class acquisition is one of the largest boat buys of its type in the world. The 100 boat Defender A Class (RB-HS) fleet began arriving at units in MAY 2002 and continued through AUG 2003. After several configuration changes, most notably a longer cabin and shock mitigating rear seats, the Defender B Class (RB-S) boats were born. This fleet was first delivered to the field in OCT 2003, and there are currently 357 RB-S boats in operation. 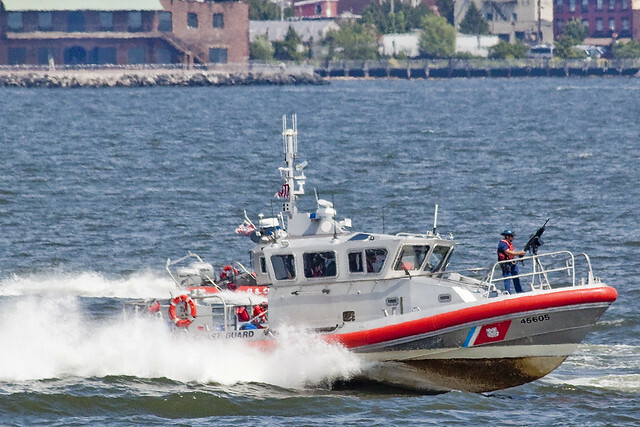 The 457 Defender Class boats currently in operation are assigned to the Coast Guards Maritime Safety and Security Teams (MSST), Maritime Security Response Team (MSRT), Marine Safety Units (MSU), and Small Boat Stations throughout the Coast Guard. With an overall length of 25 feet, two 225 horsepower outboard engines, unique turning radius, and gun mounts boat forward and aft, the Defender Class boats are the ultimate waterborne assets for conducting fast and high speed maneuvering tactics in a small deployable package. This is evidenced in the fact that several Defender Class boats are already in operation by other Homeland Security Department agencies as well as foreign military services for their homeland security missions. It was followed by a second and larger vessel, also with a manned weapons platform. 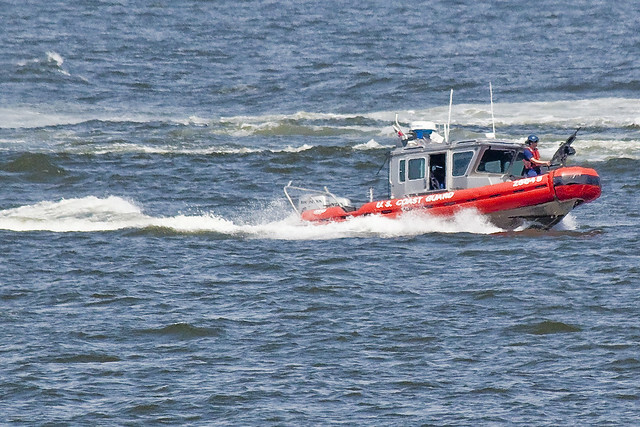 If I’m correct, this is the Coast Guard “Response Boat Medium” or “RB-M”. Vessels of this design will automatically right themselves after being capsized, incidentally. Whether or not these federal watercraft had arrived on the scene in connection with the subsurface apparition I had witnessed is anyone’s guess. State-of-the-art marine technology makes the RB-M a high performer with waterjet propulsion, an advanced electrical system, and integrated electronics that allow greater control from the pilot house. Technological and design features will improve search object tracking, water recovery efforts, crew comfort, and maneuvering/ intercept capabilities for defense operations. With the latest developments in integrated navigation and radiotelephony, command and control will be greatly enhanced, as will crew safety. 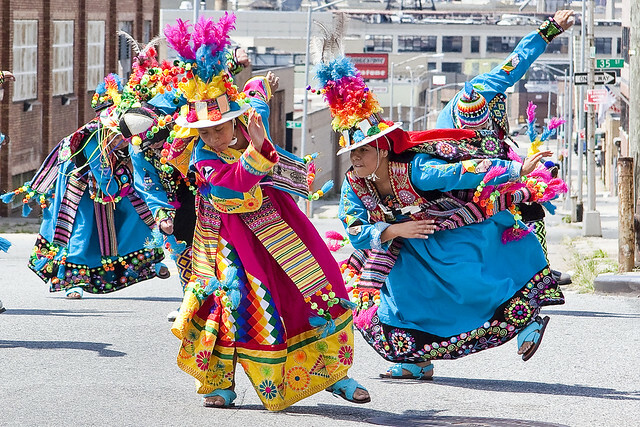 For such a busy waterway, modernity upon the Harbor of New York has not been kind to folklore. In the 19th century, lurid accounts of odd benthic organisms served to titillate and excite the attention of small boy and adult alike filtered in from the trans-atlantic routes. Stories of the Ottoman territories, and far away China, and the exotic British Raj. There aren’t many tales I can point to which might describe anything like the shape I saw, suffice to say it was something like an egg all caught up in wriggling ropes. Most of the 19th century reports describe literal sea-serpents, but such saurian behemoths would be easy prey for the Coast Guard. 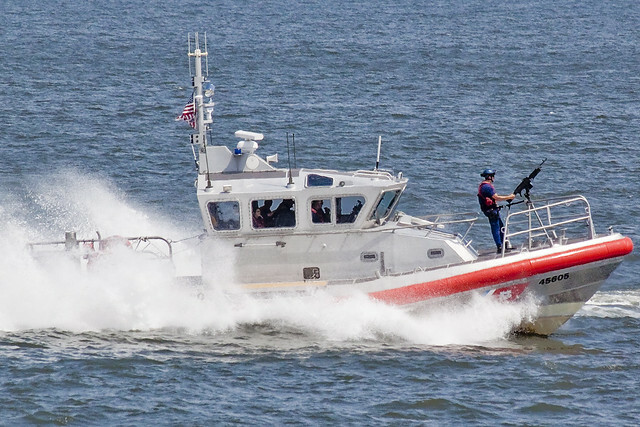 The response boat-medium (RBM) is a 45-foot (13.7m) utility boat used by the United States Coast Guard. It is intended as a replacement for the Coast Guard’s fleet of 41′ utility boats (UTB), which have been in use by the Coast Guard since the 1970s. The Coast Guard plans to acquire 180 of these RB-Ms over a 6–10 year period. The boats will be built by Kvichak Marine Industries of Kent, Washington and Marinette Marine of Manitowoc, Wisconsin. 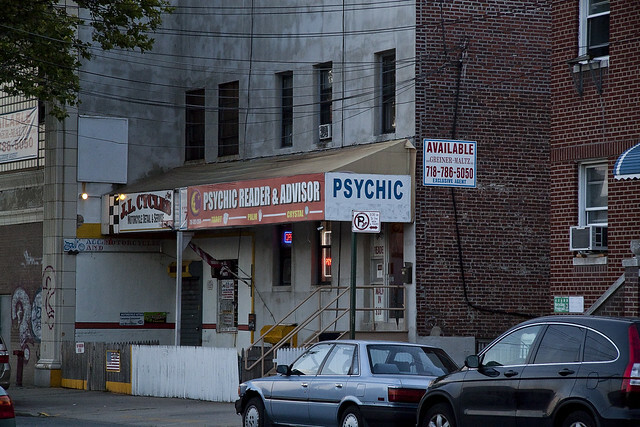 It has always puzzled me, the way that New York City is nearly devoid of supernatural lore, while its counterparts- Boston to the north, and Philadelphia to the south are so rich in it. Connecticut and the corridor of towns and cities that line the Hudson all the way to its font in Lake Tear of the Clouds compose one of the great occult highways. Utopias and experiments in urban planning line the river, as do tales of hessian horsemen and ghostly ferries and trains. It all stops at the Bronx, though. Perhaps its the financial realities of New York City, the no nonsense and to the minute mentality, or maybe its the street lighting- but London is very much in the same vein of city as we are, and they’re the original inventors of gothic spooky. Maybe it’s that in New York, you’re biggest fear isn’t what goes bump in the night but rather losing your job, or getting into trouble with some all too human monsters. for an overwhelming example of the defense industry’s love of CGI and fancy web design, click here to check out the USCG sitelet for the RB-M, which includes an interactive 3D model and fancy graphics. 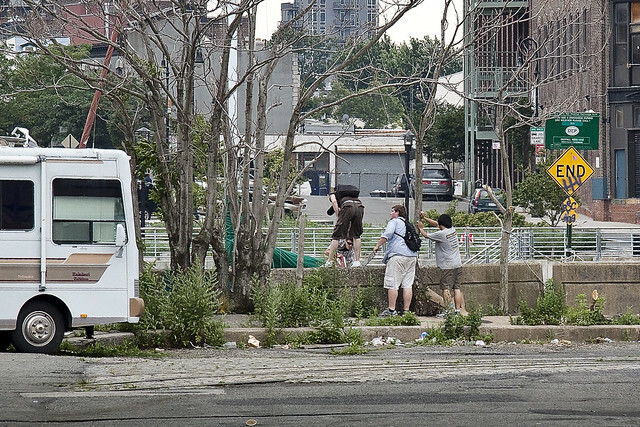 The shadow I observed seemed to be heading toward Red Hook, but the likely explanation was that the nearby Staten Island Ferry had simply cast a refracted image of itself or that the wake of a passing tuboat had disturbed some riverine sediments. The coincidence of the arrival of two armed Coast Guard vessels was just part of some regular patrol schedule, not a response to some unknown thing which could not possibly exist down there. “Burned-over district” refers to the religious scene in upstate New York in the early 19th century, which was repeatedly “burned over” by religious revivals of the Second Great Awakening. The term was coined by Charles Grandison Finney who in his 1876 book Autobiography of Charles G. Finney referred to a “burnt district” (p78) to denote an area in central and western New York State during the Second Great Awakening. The name was inspired by the notion that the area had been so heavily evangelized as to have no “fuel” (unconverted population) left over to “burn” (convert). When religion is related to reform movements of the period, such as abolition, women’s rights, and utopian social experiments, the region expands to include areas of central New York that were important to these movements. Note: If you are the owner of one of the subjects of this posting … you are in mortal and existential danger docking at the illegal location you have chosen. Sorry to call you out, but you’re going to get hurt, sick, or both. 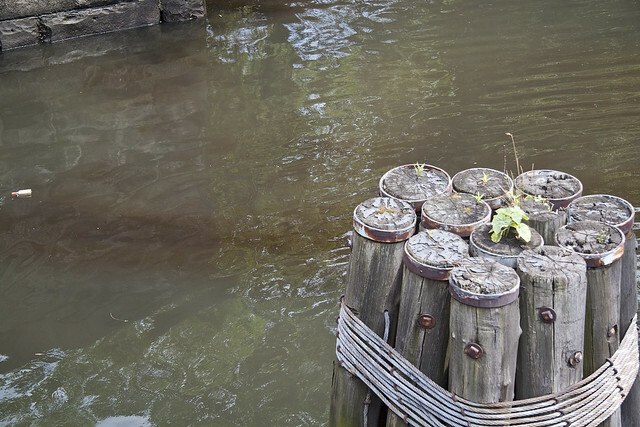 At Newtown Creek, just before the Pulaski Bridge, the foundations of the Vernon Avenue Bridge are observed. 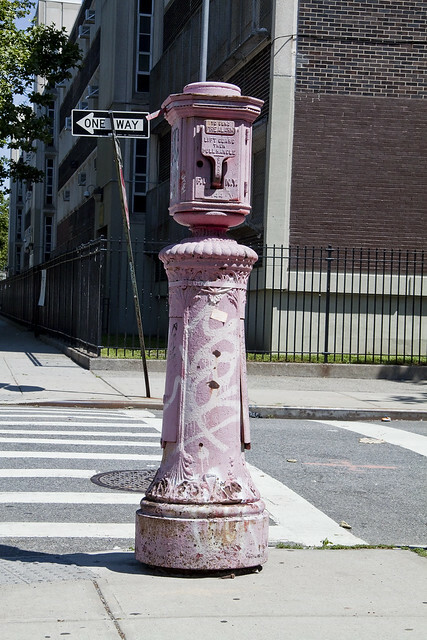 On the Queens side, its is found at Vernon Avenue -quite obviously-, which was once joined to Manhattan Avenue in Greenpoint by a bridge, whose official nomen was “the Vernon Avenue Bridge”. 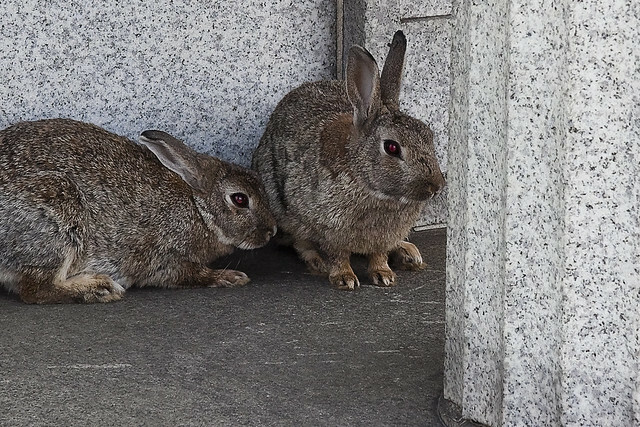 This post is not about that long lamented span which connected the two communities, instead, we’re looking at the remaining bulkheads and an incongruous and dangerous situation that the City is allowing to exist by not enforcing its own rules. 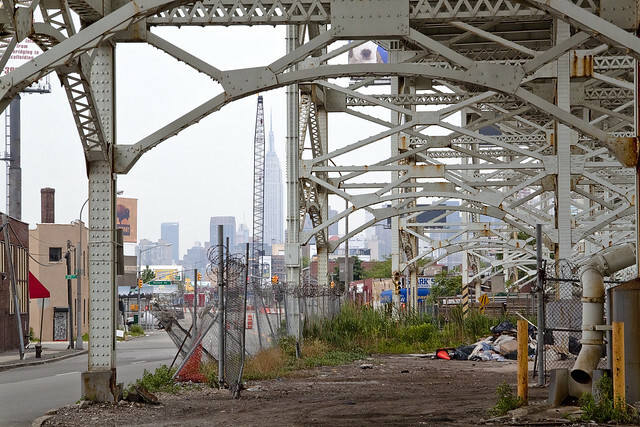 The shot above was run in the guilty agony posting of June 30, 2010, and it walks through the landward side of the area on the Queens side. It looks directly across Newtown Creek from Vernon to Manhattan Avenue in Greenpoint, and portrays several fellows accessing those docked boats which have drawn the attentions of this- your Newtown Pentacle. 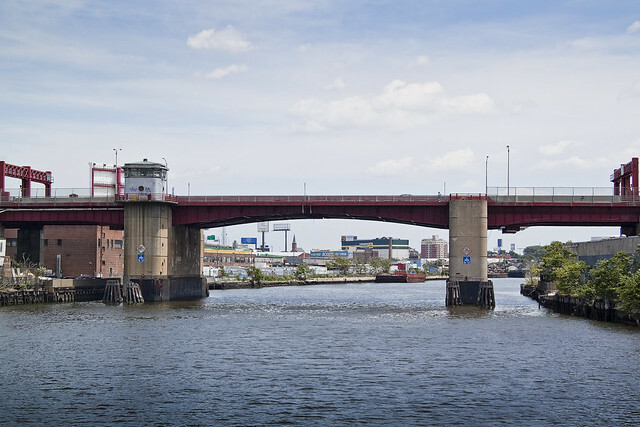 The entire scene is laid bare in the stitched panorama image above, delineating the Pulaski Bridge, and a significant proportion of the concretized Queens shoreline of the Newtown Creek is apparent. Visible in the shot are a series of small watercraft which dock at the bulkheaded shore of that malign waterway. For a long time now, there have been boats illegally docked here. For a while, there was even a timber staircase installed, but it burned sometime during the winter of 2009. Transpose this to the familiar streets, and imagine parking a car in a traffic lane on the FDR Drive, and building a private staircase so you can get to it. What’s going on here? This is an industrial waterway, after all, and should a tugboat and its multi ton barge misjudge the current- the results would be both tragic and utterly predictable. 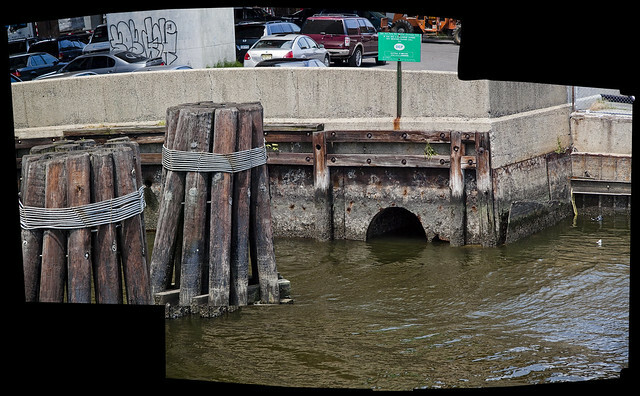 Also, for those of you not “in the know”… when you see one of those green DEP signs, you’re encountering what is known as a CSO- or combined sewer outfall. You’ll notice one in the shot above, near the second to last boat from the right, the one that’s tied onto the concrete barrier that’s breaking away from its fellows. The city, however, seems to be looking the other way. Wonder how this scenario would play out if it was residents of the Queensbridge Houses docking illegally along the East River rather than the upper class from Tower Town doing it on Newtown Creek. Two sets of rules followed by the City these days, one for the rich and one for the poor. Also, where’s the Coast Guard? I am no expert on the strategic defense of America’s coastlines, but allowing a series of undocumented small vessels to lie in wait along part of “America’s Maritime Highway” (and a frequent destination for fuel and hazardous materials barges) is the very definition of their mission and an apt candidate for “Homeland Security” attention. The CSO’s are the real villains here at the Newtown Creek. Worry all you want about the oil spill in Greenpoint, or the Meeker Avenue Plumes, but its the CSO’s that will sicken and kill you. Every bit of infected phlegm spit into the street, each can of motor oil or antifreeze dumped into the gutter, and all the pharmaceutical residue that is pissed into the system will end up spilling out here when it rains. Look for these green signs, and call the phone number scribed on them when you observe them vomiting forth their filth. Click here for the Flickr Slideshow, which I’ve just become aware, hasn’t been displaying in the usual fashion here at NP.com. I just happened to be passing St. Raphael’s on Greenpoint Avenue on Saturday the 14th of August, and found this splash of color illuminating the fossilized heart of this- your Newtown Pentacle.